Today is National Coffee Day, which I as a coffeehouse contemplative always make a point to celebrate on this blog. I first started drinking coffee in college, as perhaps many people do. But it didn't start with late-night cramming or paper-writing. Instead, it was an early morning in a hotel in downtown Atlanta, Georgia. Classes were already out for the year, but I traveled with a group from Heidelberg's campus ministry to a young adult ministries conference sponsored by the National Council of Churches called Come to the Feast. We'd taken a big van down and wanted to get an early start on the long drive back to Ohio. I was having some issues with the hour, so I opted for a cup of coffee to help me out. At that time, I needed cream and lots of sugar, which is blasphemy to me now. But the overall experience was marvelous, and that was the beginning. Since then, coffee has accompanied many hours of reading, writing, waking up, hanging out with friends, and prayer. I associate it with times of relaxation and times when I need a little extra energy. I drink it in the dead of winter to warm up and in the middle of summer despite the temperature. It's been my go-to drink of choice for almost every occasion, day or night. Lately, as much as I joke about being a coffee addict, I've been trying to cut back. I actually have some issues with acid reflux, and it turns out that coffee is one of those food items that doesn't exactly help the situation. While reflux for me isn't an enduring, overwhelming problem, the most recent flare-up I experienced a few weeks ago was enough to get me to make some necessary dietary choices. 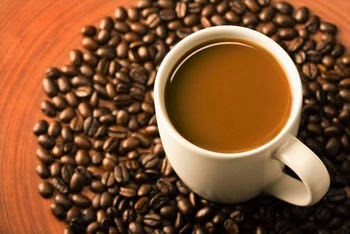 I'm aspiring to be a coffee appreciator rather than addict. I'm even drinking more pretend (decaf) coffee now. I'm down to 2-3 cups from 4-5. This needed to happen a while ago, if I'm honest with myself. So, today I celebrate coffee. I celebrate it every day, but of course today is especially the day to do so. You can look up a list of places, corporate and independent, that offer coffee at discounts or for free. While you're at it, read up on Fair Trade and the advantages and benefits it gives to farming co-ops that otherwise wouldn't have much of a chance in an economy where big corps that produce nasty crap generally rule. Happy National Coffee Day from Coffeehouse Contemplative.